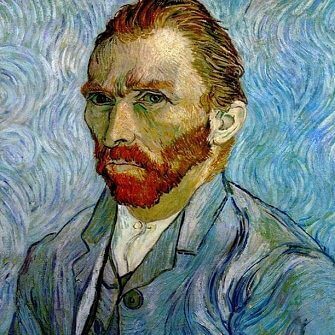 Perhaps the most famous artist in the world, Vincent Van Gogh (1853-1890) is perceived by many as the 'mad' artist, the man who painted in a frenzy or simply the tormented soul who cuts off his ear. His artistic genius is often overshadowed by those who see his paintings as mere visual manifestations of his troubled mind. Whilst in part this may be true, in reality his innovative and unique artistic style was of enormous importance to a host of artists who followed in his wake. Even when openly influenced by his predecessors or contemporaries his art remained identifiably his own, developing a distinctive style that failed to be accepted by the art-buying public in his own time. Vincent van Gogh produced his first drawings while staying at his parents' home in Etten, The Netherlands, schooled chiefly by books on anatomy, perspective and artistic technique. The artist restricted his first drawings to a black and white palette, believing mastery of this discipline to be essential before attempting works in color. His first drawings of people depict various peasants in static poses, some in profile, while his premier landscapes are largely studies in perspective. 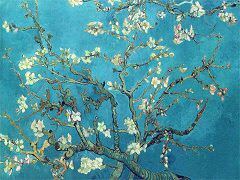 In his early pen and watercolor drawings, Vincent incorporated shadow and light rather than color to create dimension. Drawing upon the weighty influences of masters such as Millet, Rembrandt and Daumier, the artist's focus on the human figure was critical to his artistic development. Midway through 1881, van Gogh engaged in a brief period of study with Anton Mauve, a master in The Hague School of art. Mauve not only covered the basics but also introduced his pupil to watercolors and oils, thus broadening the artist's scope of expression. Vincent's Still Life With Cabbage and Clogs, one of his first paintings, makes use of the somber earth tones that characterize his early works in the Dutch style. It also features a rich splash of color, a harbinger of the brilliant Van Gogh painting style to come. Vincent van Gogh's residence in The Hague during 1882 and 1883 proved to be a productive period in which he continued to hone his technique and explore similar yet fresh subject matter. During this time, he received his first commissions for several drawings of cityscapes in The Hague from an uncle who was also an art dealer. During this era of the Vincent van Gogh's life, a failed love affair, his father's death and a short-lived period of study at the Antwerp Academy formed a bleak backdrop for van Gogh's ongoing artistic development. During a stay in the northern village of Nuenen in late 1883 through 1885, the painter focused on agrarian scenes of peasants working the soil and weavers plying their craft. In 1885, the artist produced The Potato Eaters, a work many consider to be his first masterpiece. In this depiction of a farm family seated around their humble table, van Gogh invokes the influence of Rembrandt by virtue of the shadowy setting that is nevertheless filled with personality and life. A heaping plate of potatoes illustrates the simple wealth of those who earn their living on the land. The companionable atmosphere, lit by the warm glow of a single lamp, inspires in the viewer a yearning to take part this lowly yet companionable scene. In 1886, Vincent van Gogh attended art classes at the Antwerp Academy, but remained for only part of the year. After moving in with his brother, Theo, in Paris, Vincent studied with the artist Cormon and came into contact with fellow students Henri de Toulouse-Lautrec, John Russell and Emile Bernard. Theo, an art dealer, introduced his brother to the works of prominent Impressionist painters such as Claude Monet, Pierre-Auguste Renoir and Georges Seurat, all of which had strong influences on the artist's future paintings. Vincent met and befriended the artist Paul Gauguin during this same period, and Gauguin's brilliantly hued paintings also exerted an influence of the Dutchman's art. In 1887, Vincent experimented with the pointillist technique espoused by Seurat, who used it in such works as A Sunday Afternoon on the Island of La Grande Jatte. In one of his many self-portraits: Self Portrait with Grey Felt Hat, Vincent utilizes tiny points of light-reflecting color to reveal a sharp-featured man with the world-weary expression of someone who has seen more than his share of hardship. It was during this time of his life that the artist began developing an interest in Ukiyo-e, Japanese woodcut prints, which he and such contemporaries as Claude Monet and Edgar Degas began to collect, and which would inspire paintings reflecting the Japonaiserie influence on his artistic vision. Van Gogh's 1887 interpretation of The Courtesan, a work by Keisai Eisen, features an infusion of brilliant colors that far outshine the original. He chose a background of a lily pond in place of Eisen's cherry blossoms. Vincent van Gogh moved from Theo's Paris home to Arles in southern France in 1888, where he rented The Yellow House. In spring, he painted the blossoming landscapes of Provence as well as seascapes in nearby Saintes-Marie-de-la-Mer. During this productive period in the artist's life, he also did a number of portraits, including his series of the Roulin family. As he was preparing a room in his Yellow House to accommodate Gauguin, who planned to visit Arles for an extended stay later in the year, Vincent was also working on his second series of the Sunflowers paintings. He had created the first series while staying with his brother in Paris. 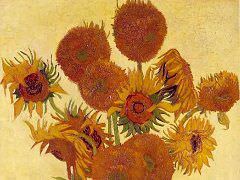 The artist's sunflower paintings featured various backgrounds and arrangements of the large, golden flowers, each one similar yet distinct. Art experts especially appreciate these works for their innovative expansion of the yellow color spectrum. Others appreciate the paintings for their unique blend of simplicity and richly evocative detail. Although much-anticipated by van gogh, the arrival of Gauguin at the Yellow House in October 1888 did not end up as planned. At first, both artists enjoyed a prolific period in their careers, but disagreements and arguments tainted the productive tenor of their visit. Tensions between the two culminated in late December when Vincent purportedly attacked his colleague with a razor, and failing to engage, cut off part of his own ear. Vincent spent the next few days in the Arles hospital. Subsequently, the artist entered care at the asylum at Saint-Remy-de-Provence, and although struggling with rapid mental deterioration, he produced a series of stylistically diverse paintings that depicted the hospital itself and well as the surrounding grounds, olive trees and cypresses. 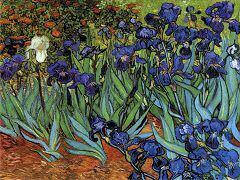 Vincent van Gogh painted his brilliant 1889 work, Irises, in the garden at Saint-Remy during his stay. 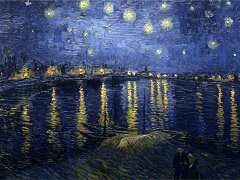 The painting, which exhibits some characteristics of Japanese woodcuts as well as the artist's penchant for color and light, was part in the annual Societe des Artistes Independant exhibit in Paris, thanks to Theo's intervention, along with the Van Gogh painting, Starry Night Over the Rhone. The prestigious exhibit introduced the artist's genius to a wider audience than ever before. With his illness exacting an increasing toll on his daily activities, the last months of Vincent van Gogh's life were nevertheless his most productive. Amid gradually increasing recognition for his work, he entered a period of extreme fruitfulness during his final 60 days on earth. 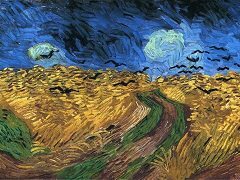 Wheatfield with Crows is believed to be the last work of Vincent van Gogh. As he approached the end of his life, the artist transitioned to the green and blue color spectrum prominent in Thatched Cottages at Cordeville. He also favored curved, undulating lines to indicate movement and energy, such as the fenceline in the foreground of the painting and the treetops behind. The distortion of familiar shapes, such as the cottages themselves, takes the artwork beyond Impressionism toward new iterations of expression. Vincent was establishing an entirely fresh Post-Impressionistic style as he advanced toward the day of his death, July 29, 1890, at the age of 37. 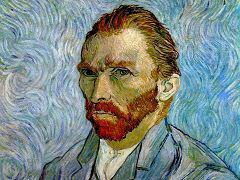 In the decade following van Gogh's death, his former colleagues, including Gauguin, Paul Cezanne, and Henri de Toulouse-Lautrec as well as contemporaries such as Edvard Munch and Gustav Klimt continued to innovate, incorporating influences from the now-mainstream school of Impressionism as well as Van Gogh's brand of Post-Expressionism into new artistic styles. 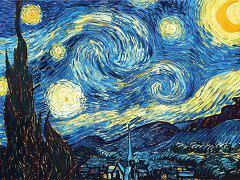 Just like Shakespeare on literature, and Freud on psychology, Vincent van Gogh's influence on modern art is extraordinary. 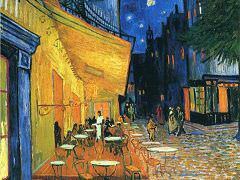 Van Gogh did not live to see his talent recognized. Nor could he possibly ever have dream that he would be an enduring source of inspiration for subsequent generations of artists. The career of Vincent van Gogh as a painter was short, but his paintings revolutionized artistic practice and styles. The intensity of his vision, his wonderful sense of color and the extraordinary boldness of his technique created masterpieces that exercised a profound influence on the art of the twentieth century.